Our technicians provide high quality, lasting striping and marking services that boost noticeability and communication while reviving the look, feel, and performance of your structure. If you are needing a seal coating for asphalt or concrete, you can rely on our experts for help! 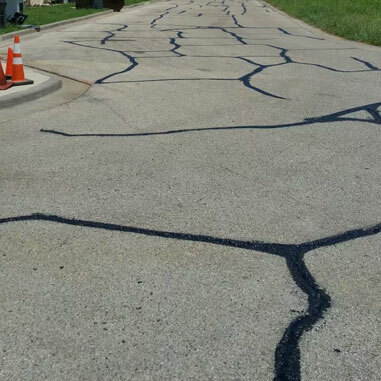 Our professionals are able to perform crack sealing service for asphalt and concrete surfaces. 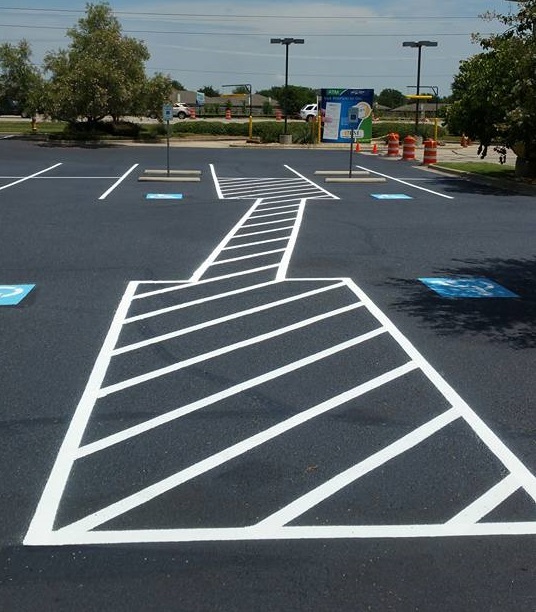 We are able to provide striping for handicap parking spots, warehouses, roads, and more! At eSquared Asphalt Maintenance, we pride ourselves on offering comprehensive, convenient service at the right price. We understand the importance of keeping your parking lot and exterior surfaces clean, presentable, and compliant, and work hard to provide services that can help you achieve your goals. When you need exterior cleaning or maintenance, or if you need parking lot maintenance around Waco and Temple, TX, call our experts at 254-716-8685 to receive impeccable service that fits your budget. Make a great first impression on your patrons with an asphalt lot that’s smooth, uniform, and brightly painted by our experts. Your driveway is a centerpiece to your home. When it needs repair or replacement call our professionals for convenient service that doesn’t break your bank. Our professionals can complete your logo painting with top quality, long-lasting paint that follows all ADA regulations. Protect your parking lot and maximize its longevity by boosting its resistance to traffic, water, UV rays, and wind. Learn what makes this paint so reflective at night and in the rain, and find out if it’s the right solution for your job. Let our experienced painters complete your temporary or permanent road striping job with accuracy and speed. We Resurface and Repair Asphalt! Does your asphalt parking lot or driveway have a ton of cracks or damages that are beyond repair? Then you need professional asphalt resurfacing. Asphalt can begin to crack or show other signs of wear and tear due to exposure to sun, rain, car wear, and temperature changes. A lot of times a driveway or parking lot will be completely replaced by breaking up the asphalt and repaving it. Not only is this costly, but it can take up a lot of time. Instead of going through this process, our specialists recommend resurfacing the old asphalt. We are able to remove cracks, holes, and other damages easily and quickly so that your driveway or parking lot is restored. The only time we won’t consider asphalt resurfacing is if the foundation of your parking lot or driveway isn’t stable. In situations where your asphalt driveway or pakring lot has little pothole or cracks, we are able to offer asphalt repair. This will address little issues before they become too big. 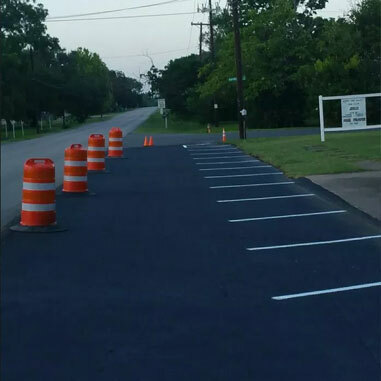 For parking lot maintenance in Waco and Temple, TX that requires asphalt resurfacing or repair, please give us a call today. 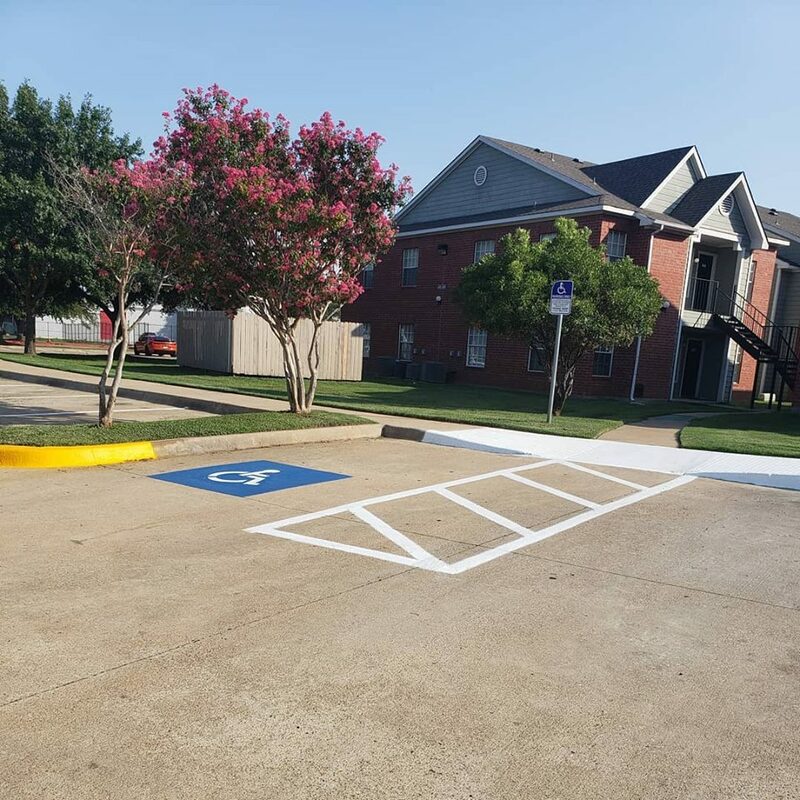 Our parking lot striping and pavement marking team can complete any painting project you require accurately and in compliance with all ADA and EPA regulations. Our services can be completed within your schedule to minimize interruption to your business. 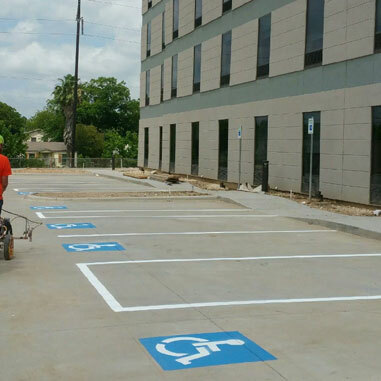 Keep your parking lot clear, inviting, and in compliance with parking lot striping performed and even parking lot maintenance in Waco and Temple, TX by our experienced technicians. 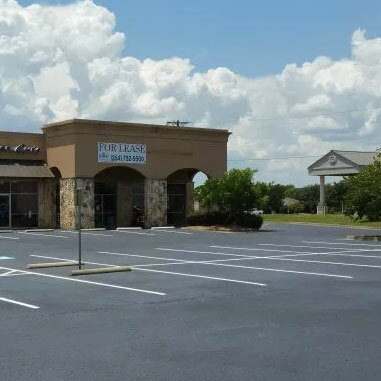 When you need parking lot maintenance services to improve the look and function of your space, our professionals can offer realistic solutions for every budget and requirement. Our knowledgeable team is up to date on your area’s regulations to ensure that you are always satisfied and compliant with every task we complete. Whether you need commercial parking lot repair or residential patio installation, our professionals are here to help. Our technicians can complete any concrete installation job accurately and to your specifications for a finished product that you can be proud of. Our professionals are experienced and trained to ensure that your concrete is smooth and uniform from the outer layer to the sub-base. Updated on April 3, 2019 at 1:25 pm by eSquared Asphalt Maintenance.